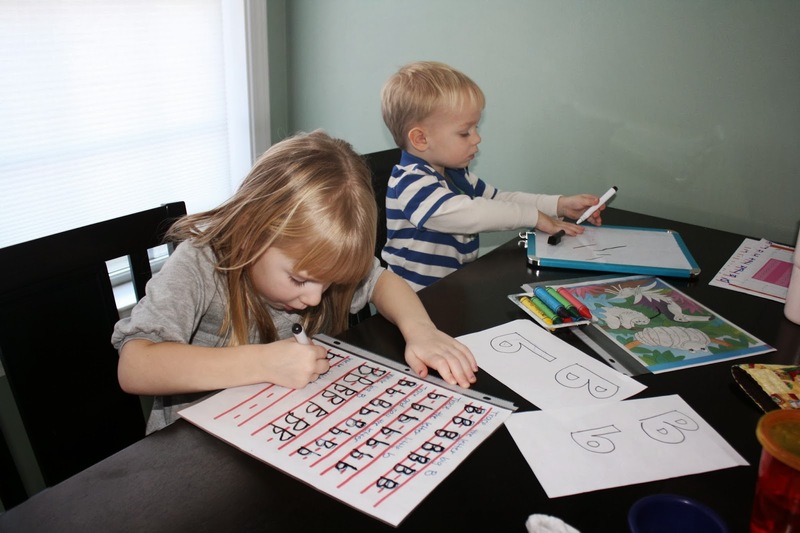 May the Schwartz Be With You: The Schwartz's vs "Preschool"
I have NO interest what so ever in homeschooling my children. I have never had an interest in it. The thought hasn't so much as crossed my mind for even a second. 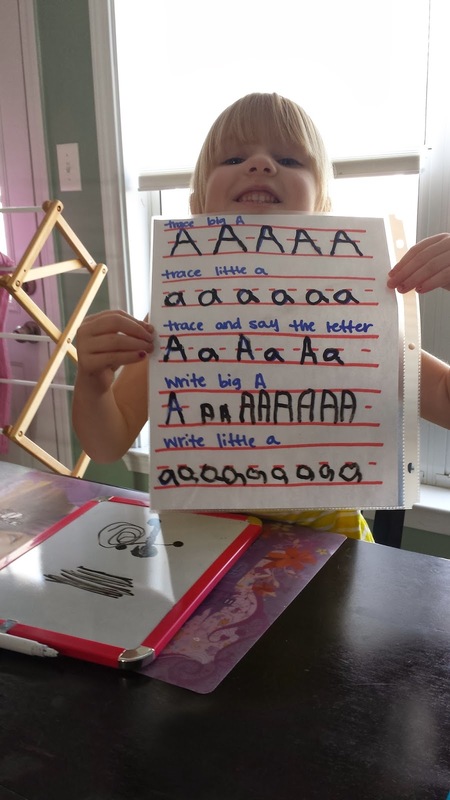 I am so overwhelmed by the concept of how to teach such important skills like letters and reading that I never even planned to do preschool work with my kids. My plan has always been to send them to mother's day out. And I have a lot of reasons why I thought that was going to be best way to get my kids ready for kindergarten. However, my bubble got a little burst at Sarah's 4 year check up, and my plans needed to change. As Sarah was being her normally crazy self in her check up I jokingly asked Dr. Catherine if she wanted to go ahead and stick the ADHD label on Sarah and give me the drugs or if we really had to wait until all the teacher notes started coming home in a couple of years. I also lamented that while Sarah is incredibly verbal, she has no interest in learning her letters or learning how to read. I was shocked when Dr. Catherine told me the problem was a lack of structure. Then I thought, duh. Of course. It was funny at first because if you know me I seem very structured and disciplined. But, we really aren't. We are very regulated and we have strict routines, but I really don't have any structured time set up where I ask Sarah to sit down and focus on something. And routines and structured focused activities are 2 different things. Sarah needs to sit down and be taught how to focus and finish a learning task. So, it was either time to cough up the dough for Mother's Day out, or it was time to add some structure to our day. Being cheap, I'm surprisingly going with the do it myself approach. We are only in week 2 and every time I sit down with her to do something I really regret this decision. I just don't have the patience for this. I hope that this will be a learning experience for both of us. My game plan right now is to do 3 days a week for about 15-20 minutes each day. Right now we're just working on letter names and recognition and we are doing 1 letter a week. I'm hoping this will get her use to sitting and focusing and then we can add more skills and perhaps switch to themed units. Not sure. I'm really taking it one day at a time right now. 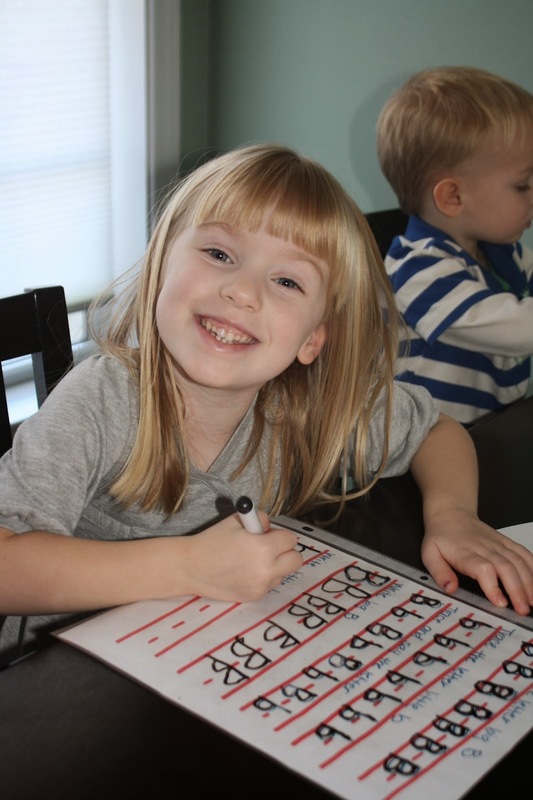 I bought a preschool workbook at Costco for $8, and am looking for ideas on pinterest. I know I need to incorporate some crafts to keep her interested. The first day as I was flipping through the workbook I found lots of tracing sheets they called "prewriting skills" but no tracing the letters worksheets. So I decided to make my own while Sarah worked on the prewriting skills sheets. Because I am cheap and want to be able to reuse the worksheets I slip them in a plastic page protector and let the kids use dry erase markers to write on them. Here's Sarah working on her As. The first 2 lines she just has to trace the letter. The 3rd line I had her trace and say what the letter was. 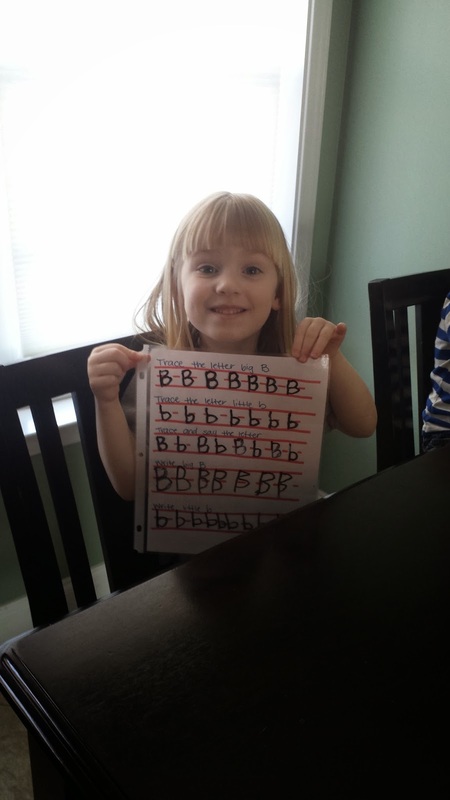 Then the bottom 2 lines she traced an example letter and wrote the rest by herself. 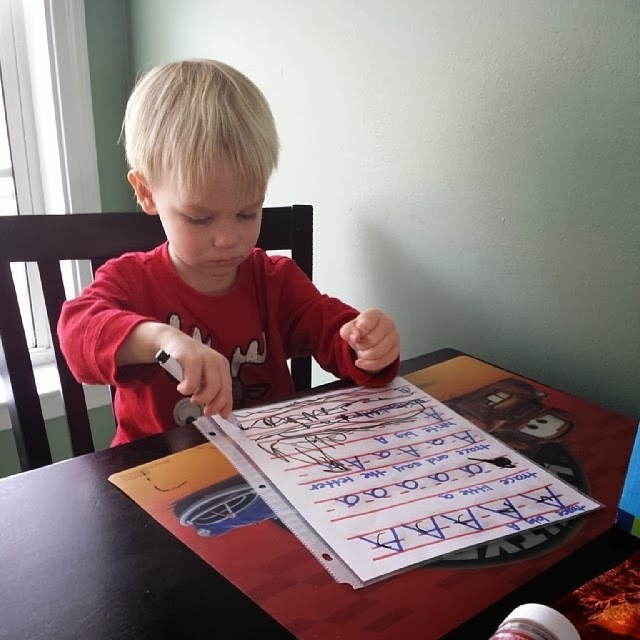 Cody working on his As. Cody was so cute and excited the first day. He had his own sleeve with a prewriting skill sheet. He basically colored all over it. But I only made one letter sheet. So as soon as Sarah finished it he said, "Cody turn to do letter A!" As you can see he still just basically colored on it. But he was focused and happy about it. The next day we traced our letters again and worked on finding them. She had a page for big A and a different page for little a. This was when I started to get real frustrated real fast. 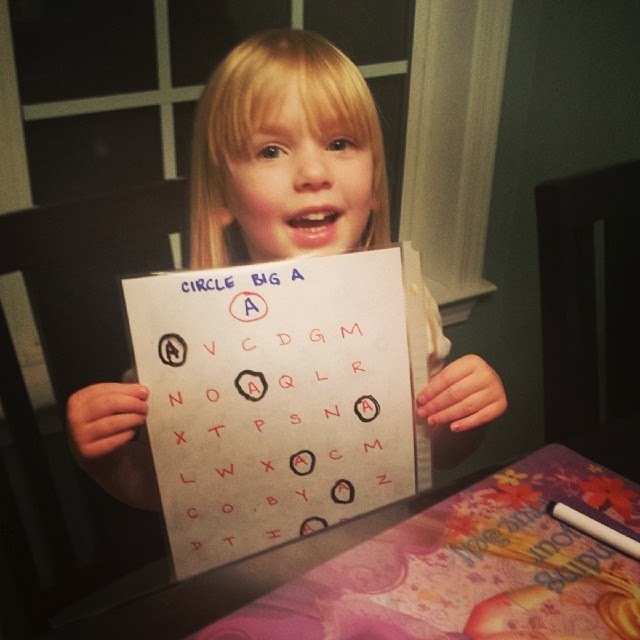 She was fine at finding the letters but she would not follow directions and just circle it. She'd trace it. She'd color over it. At first I was just going to ignore it but part of this is to teach her how to listen, comprehend, and follow directions. So I made her erase it and try again until she just drew a circle around the letter. Today we started on the letter B. I made another letter tracing sheet and also made a bubble B for them to color and we can hang up. However Sarah took so long on her letter sheet that we didn't get to color today. And I was ready to pull my hair out. But thankfully she was smiling through it so as frustrated as I was getting at her difficulty with the big B, I at least wasn't letting it show enough to upset her. Done with B's time for a fun pattern game. I noticed in the Costco workbook that there is a huge section on pattern recognition. 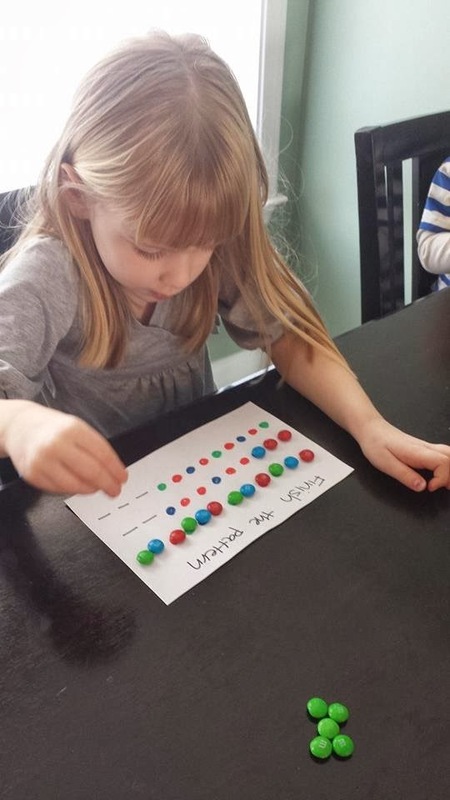 So I thought it might be fun to do a little hands on manipulative activity for patterns today. 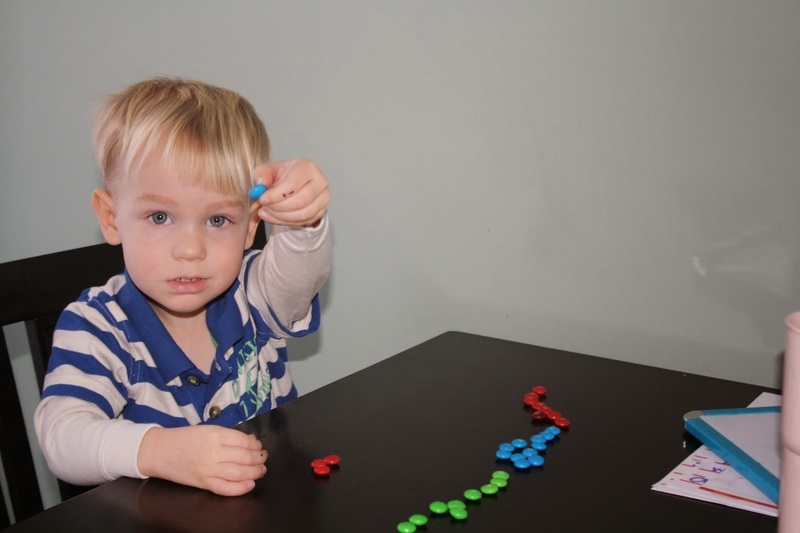 Plus I have an excess of M&Ms since we failed to potty train Cody recently. 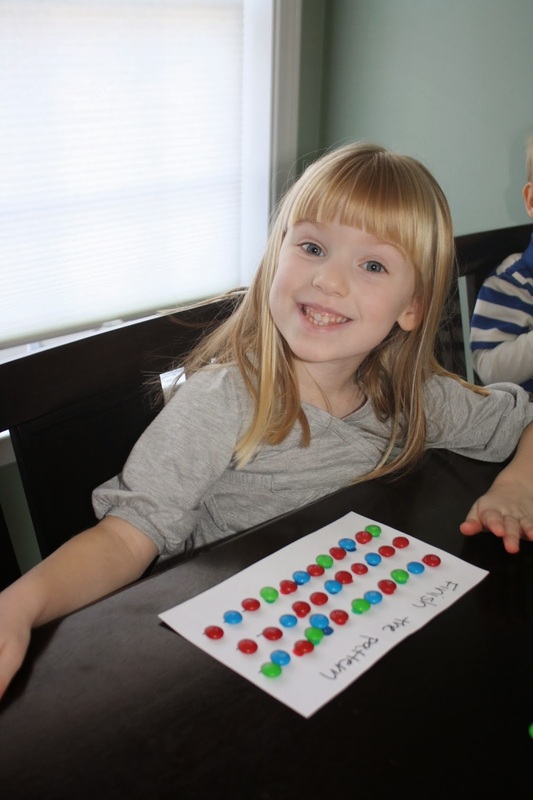 So I made some quick pattern sheets for each of the kids and got a bowl of red, green, and blue M&Ms. First I had them sort the M&Ms by color making 3 different piles. Cody sorting the last blue. 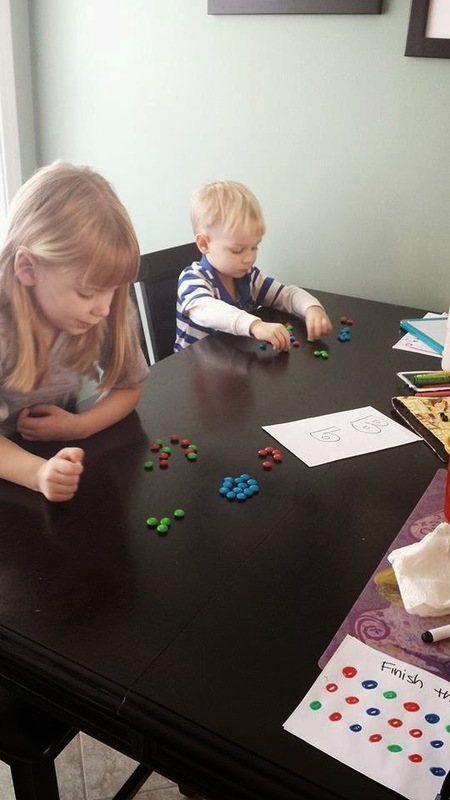 I shared this picture on FB with the caption "teaching my kids OCD by having them sort M&Ms by color." I think one person took me seriously. I was just kidding. You can see my high tech pattern sheet I made in the bottom right hand corner. After they sorted their candies I explained NO EATING THE M&Ms until you are completely done and I say it's ok. You will get to eat them but NO SNACKING during the game! 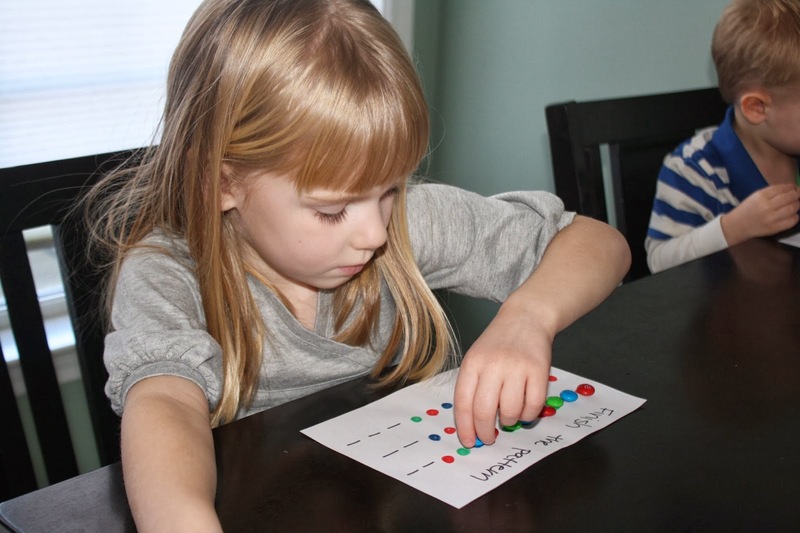 Matching the M&Ms trying to find the pattern. Filling in the blanks at the end of the line. I really worked with Sarah on reading the pattern line and trying to logically decide what would come next. She is 4 so her logic is lacking, we'll be doing more of these activities. But probably not with M&Ms every time. That was way too much candy! Since I was focused on Sarah doing it right Cody was doing his own thing. But when I looked over I was impressed. Rather than working on the patterns per say he just worked on matching colors. He did all the blues first, then all the reds, then all the greens. Whatever, works for me. As soon as he was done and had me "check his work" he also started shoving M&Ms in his mouth for fear I might change my mind and take away all the glorious candy. I reassured him that they were his and he didn't need to chipmunk shovel them into his mouth. So that's where were are so far. It's way harder then I thought it was going to be. It's probably going to teach me a lot about patience or drive me to drink. It has reaffirmed that I am not an elementary teacher. 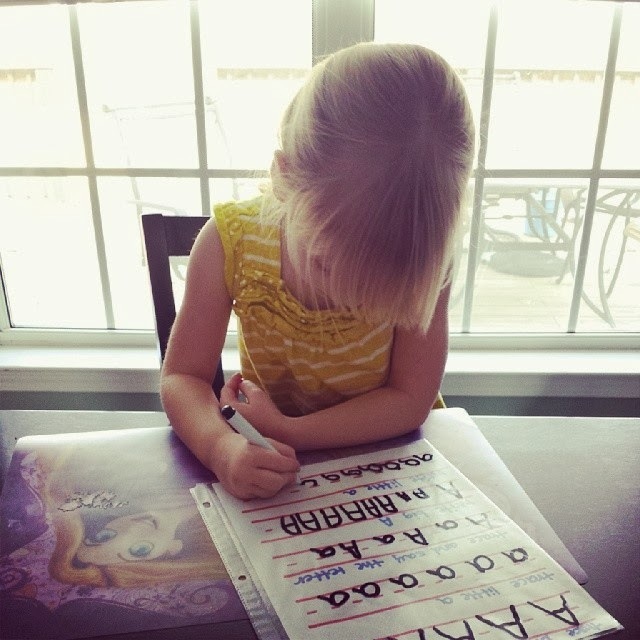 But I love how excited both the kids are when its time to work on letters. I love how proud Sarah is when she finishes a letter sheet and how Cody doesn't want to be left out. We didn't have time this Monday (i.e. I didn't want to do it) and they were both disappointed at bed time when Sarah pointed out that we never did our letters. I'm hoping their enthusiasm will propel this forward and we'll all enjoy doing this. Because heaven knows we have to do it. 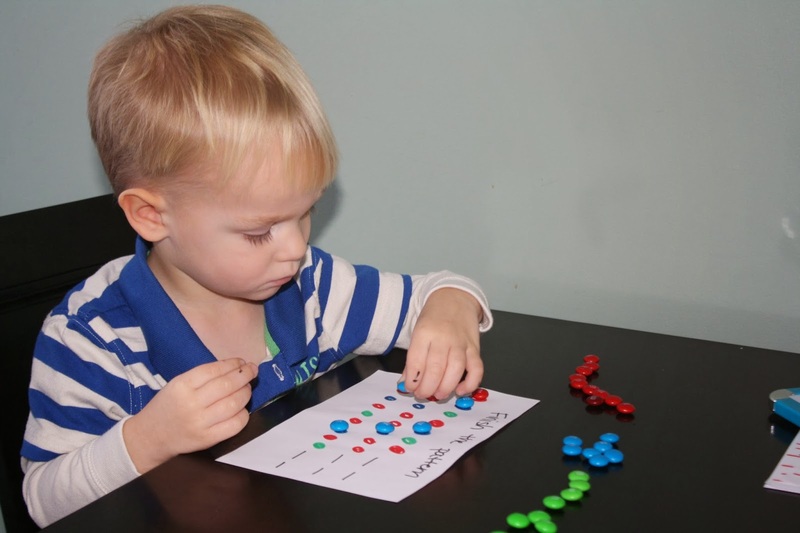 If you're interested, I can send you some links of FREE preschool stuff to print out.